Summary V2 revision of Broadcom-based AC1900 router with a faster processor and improved storage throughput. You may have noticed the trend of "exclusives" for networking products, where products are available only from one or a handful of retailers. 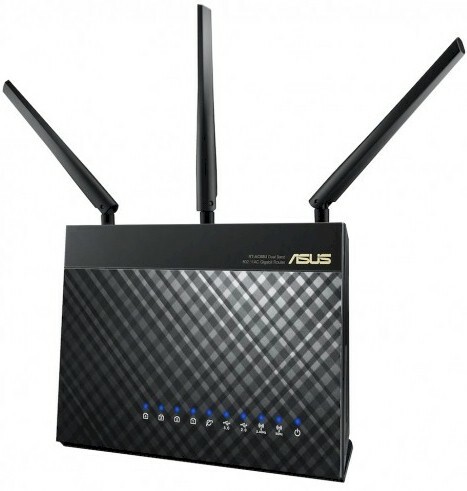 Best Buy has taken this one better with the RT-AC68P Dual-band Wireless-AC1900 Gigabit Router, which is permanently available only from them, with the same $200 price tag commanded by its available-everywhere RT-AC68U. The 68P is actually the RT-AC68V2, according to its FCC ID designation, and uses a different board with a few new components that I'll detail shortly. The callout diagram from its Quick Start guide shows that ports, lights and switches are the same as the 68U. All features and functions of the 68P are the same as the 68U and, as such, it can be loaded with alternative firmware such as RMerlin's perennial favorite, Asuswrt-Merlin. The real story of the 68P is its hardware design tweaks. ASUS asked the FCC to withhold internal pictures until next month (February 2015), so I opened up the review sample I purchased from Best Buy. The view above, with heatsinks and RF can tops removed, is very similar to the photo below from the 68U's review. Note the addition of tape to ensure that the antenna cable doesn't get pinched, as it did in my 68U review sample. Also note the 68P's metal shield around the USB connectors, compared to nothing around the 68U's connectors. Key components are summarized in Table 1 for both the 68P and 68U. Thanks to WikiDevi, I was able to identify the 2.4 GHz power amplifiers in both versions. The info below verifies information previously shared in this forum thread. The main differences are the upgraded processor (BCM4709) and different 5 GHz power amplifier. Output power is spec'd differently for the two devices, but there doesn't appear to be an appreciable difference. The gallery below contains more photos of both the 68U and 68P boards with commentary. The view when you pry off the top cover, after you remove two screws hidden under the large label on the rear. The heatsink is coupled to the board bottom via a thermal pad. It sits beneath the RF amplifiers. Note the RF can under the CPU and RAM doesn't cover the flash memory. Same view for the 68U. Note the RF can outline that includes the flash memory, but no RF can. Same heatsink under the RF amplifiers. Removing the board and flipping it over shows two smaller heatsinks vs. the single large heatsink on the 68U. Left heatsink covers the radios and RF amplifiers; right covers the CPU and RAM. In the 68U, one big ol' heatsink covers both the radio and CPU sections. Note no shield over the USB connectors (bottom left). Same view with the heatsink and RF enclosure tops removed. The BCM4709 SoC and RAM are in the right compartment, the two BCM4360 3x3 802.11ac radios and RF amplifiers are in the left box. Note the extra partition between the radio SoCs and RF amps. There were no thermal pads to couple the RF amps to the RF can top. Same view with the heatsink and RF enclosure tops removed. The BCM4708 SoC and RAM are in the right compartment, the two BCM4360 3x3 802.11ac radios and RF amplifiers are in the left box. The 5 GHz amps had thermal pads coupling them to the RF can top. This view shows the heatsink removed. Note there is no shielding applied to the USB 3.0 connector area. The RF can covers the some of the area under the CPU and RAM. Same view for the 68U. No RF can to cover the CPU and RAM. No shield under the USB connectors. Digging through the FCC ID filings turned up a Class II permissive change filed at the very end of 2014. Among the modifications the letter describes is changing the radio SoC from BCM4360 to BCM43602. The new chip is used in Broadcom-based AC3200 class routers like NETGEAR's R8000. It takes the BCM4360 3x3 802.11ac MAC/PHY and adds a local processor and 960 KB of SRAM to make a complete standalone radio. The new device can't change any RF characteristics, but it will completely offload 802.11 packet processing from the main CPU. This could boost storage performance. I didn't expect my review sample had the BCM43602 and visual inspection confirmed this. I've asked ASUS when this change will be rolled into the 68P and will update when I hear back. As noted earlier, the RT-AC68P is functionally equivalent to the AC68U. So, all the goodies like Quick Internet Setup (QIS), Bandwidth Monitor, Adaptive QoS, AiProtection and AiCloud are there. IPV6 is also supported for both WAN connection and firewall. VPN support is flexible with both PPTP and OpenVPN servers. And dual WAN support is included for both select 3G / 4G WWAN USB dongles or by repurposing one of the LAN ports to connect to a second cable or DSL modem. If you want a little more feature detail, the RT-AC87U review has some. A key weakness of the RT-AC68U has been its inability to make full use of its USB 3.0 port. The most I've gotten is 24 MB/s, despite repeated attempts with different firmware and both enabling and disabling its Reducing USB 3.0 interference setting. So I was happy to find that the 68P seems to have solved the problem. I tested using our standard Startech USB 3.0 eSATA to SATA Hard Drive Docking Station [SATDOCKU3SEF] with a WD Velociraptor WD3000HLFS 300 GB drive, using Windows Robocopy to run the same Windows Filecopy test that's part of our NAS test suite. Tests were run on both FAT32 and NTFS volumes with USB 2.0 and 3.0 connections and 3.0.0.4.376_3626 firmware installed on the router. I also disabled the router's media server, to ensure no automatic file indexing affected results. All tests were also run with the Reducing USB 3.0 interference setting disabled, which should enable full USB 3.0 throughput. Table 2 summarizes USB 2.0 storage performance for the 68P, top-performing Linksys WRT1900AC and runner-up NETGEAR R7000. While there are some minor differences in the numbers, you wouldn't find any practical difference in everyday performance. To check whether newer firmware was the key to improved USB 3.0 performance, I hauled out my RT-AC68U review sample, installed the same firmware and ran a USB 3.0 connected, NTFS formatted test. So Table 3 includes both 68P and 68U results. I had to run the 68U's test a few times because I got drive disconnects at first and some unusually high results in another test run. But after I rechecked settings and reformatted the USB test drive, the 68U settled down and produced the USB 2.0-like results shown in Table 3. The results show the Marvell-powered Linksys WRT1900AC is still the router storage performance champ. But the AC68P makes a strong showing, beating out NETGEAR's R7000 Nighthawk in all but FAT32 writes—a weakness common to both products. So, congratulations, ASUS. You've finally produced an AC1900 router with decent USB 3.0 connected storage performance! Routing performance for the 68P loaded with 3.0.0.4.376_3626 firmware using our standard test method is summarized in Table 4 beside the 68U's results. Tests with both NAT Acceleration / Cut Through Forwarding enabled (the default) and disabled were run. Traditional QoS, as supported by FW 376_3626, will force NAT acceleration (CTF) to be disabled at boot time. However, the newer Adaptive QoS is compatible with CTF. Adaptive QoS is only available with FW 378_xxxx. The LAN setting can now be set to either Disabled (meaning always disabled) or Auto (meaning disabled automatically if an incompatible feature is enabled - like Traditional QoS). This is more accurate than the old setting that let you select "Enabled", but the end-user might not realize that it was still being forced disabled by an incompatible feature being enabled. The IxChariot composite plot for unidirectional up and downlink tests shows periodic peak throughput above 900 Mbps in both directions. Simultaneous up/downlink throughput is pretty good at 1369 Mbps, but doesn't set a new Chart high. Upload traffic seems to get priority when both directions are fully loaded. However, this could be a quirk of our test method, since this behavior is pretty consistently seen. Here's the unidirectional plot with NAT Acceleration disabled. Bottom line is there is no significant difference in routing throughput between the 68U and 68P.